FPRDI Engr. Juanito P. Jimenez Jr.’s research titled “Tobacco Particles as 4-in-1 Additive for Plywood Adhesive” bagged 1st place both in the paper and poster competitions under the Research Category. “Tobacco stems result in wastes amounting to 54,000 tons per season. Nicotine and other alkaloids found in tobacco stem pollute the soil if left to decompose, while burning it contributes to air pollution. In our study, we found out that tobacco stems can be made into plywood glue additive as filler, extender, formaldehyde scavenger and termite repellent,” said Engr. Jimenez of FPRDI’s Technology Innovation Division. Meanwhile, FPRDI Engr. Alvin F. Vardeleon, Engr. Ceazar A. Cuaresma, For. Robert A. Natividad, Engr. Victor G. Revilleza, Engr. Edward Paul S. Marasigan and Engr. 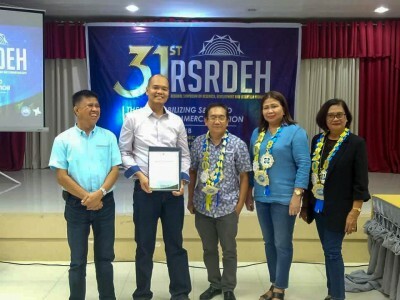 Ruben A. Zamora’s research titled “Design and Development of Portable Solar Powered/Heated Dryer with Auxiliary Biomass Heater” won 2nd prize in the paper competition and 1st prize in the poster competition under the Development Category. “Generating electricity from the sun through solar panels is practically free, nearly limitless and produces almost zero pollution. The portable solar drying chamber with biomass heater makes the drying of raw materials simpler by using solar heat and solar energy. Although the initial investment is high, free electricity can be enjoyed for years with almost no maintenance cost.” explained Engr. Vardeleon.